SecondHandSaintsblog | Striving to live the life that God intended for me, by praying, and seeking to use the inspiration handed down, by those who struggled and made their way to Heaven and the Lord….those declared saints of our Holy Mother Church. What a perfect timing. This is just the message that we the faithful need as we head towards the second week of Lent. Last week, many of us began our Lenten journey with giving up things, or with ‘doing without’ for Lent. According to the Church rules we are called to abstain and fast these forty days, and being so inclined, many of us add other sacrifices to our daily routine. As a whole, we are good at giving up things for Lent, but few of us are willing to take that leap of faith and put all of our trust into the Lord. We give up our sweets and do our penances, but we don’t give ourselves over to God. And the Church, being the good Mother that She is… reminds us that instead of giving up, we should be more focused on looking up…on looking towards the Lord and instead of looking horizontal, or just focusing at our place here on earth, we should be drawing closer to the Lord. We should be uniting ourselves with the Lord, by placing all of our cares, all of our worries… all of our everything with God. We have got to stop doubting what we have been taught. We have have to stop distrusting the Truth that Jesus Christ revealed to us through His disciples. Instead of living this Lent with the mindset of ‘what can I sacrifice?’ …or ‘what can I give up?’… Let’s take a moment today and ask God to help us to be who He created us to be. Let’s stop pretending that we can do it on our own, because we can’t… and we shouldn’t … God wants to help us. We are His children and He is more loving than the most loving Father here on earth. He wants us to depend on Him. He wants us to ask Him for everything. He wants us to be bold and ask for all of these things and more. After all, He wants us to submit ourselves to His Holy Will which is Love and Mercy Itself. Can you say ‘Jesus I Trust in You,’ and mean it. Really mean it ? Make that your goal for Lent. Let’s all make that our goal. We may just be surprised where we wind up. We never know where God will lead us, but we can be sure that it will always be what is best for us… even if at first, it doesn’t feel like it. Happy first Thursday of Lent. God bless. This is just one of the many pictures that are online of the March for Life that took place yesterday in Washington D.C. Unfortunately, like in years past, E.W.T.N. was really the only television station to provide full day coverage of the event. Most of the news channels avoided it, and the others that did mention it failed to point out the huge number of people that had gathered in the snow covered streets of D.C. to once again stand and “march’ for life. Some reports are going as high as 700,000! January 22nd marks the 46th year since the grande courts of America turned their heads… their hearts, and their votes against the most vulnerable in society… the unborn. So many people today can’t even imagine a world where the killing of an innocent pre born child would not be considered a ‘choice’. And yet, even in this culture of death, there is hope. So many of those who march are from this same age group. They have never known a world without abortion and yet they hang onto the hope of such a world. They are able to discern the truth of life from the lies of the world and they are marching. Marching in record numbers to be a voice for the voiceless. Gathering in the cold to show the world that they will not sit by and watch these atrocities occur without doing something. As faithful Catholics we need to take up this march. Not just in D.C. but where we live. Where we work and raise our families. I’m not just talking about standing for the unborn. I am talking about standing for those who are born. Those who are struggling with just getting by. Standing for life. In all circumstances. The unborn. The old and infirm. Those that the rest of society has forgotten. Those who are without hope. We have to march for ‘life’ for them as well. We have got to be the hands and feet of Christ. We have got to be pro-life for the sick and those who are suffering. We have got to be pro-life for them as well. How? We have got to give them hope. We have gt to share the word of God with those who are marginalized, those who suffer. Those who are alone. On this feast of the Epiphany, I would like to share a blog from Father Gregerson, a priest from the Diocese of Fort Wayne, Indiana. He does such a wonderful job of explaining the beauty as well the meaning behind the celebration. I do hope you have a wonderful feast day and enjoy his blog. Why do you all think that Christmas is such a big deal? We can imagine this question being posed by someone who doesn’t know much about Christianity – maybe someone from China, Iran, or North Korea. But that same question would actually be posed to us by the earliest Christians themselves! To them, today’s feast of the Epiphany was much more important. On this eleventh day of Christmas and this fourth day of the ‘New Year,’ we are still in the Christmas season and should still be following the star… following the path of the Wise Men in their journey towards the Baby Jesus. Even though Christ’s birth happened over two thousand years ago, we still have an opportunity to visit Jesus and pay homage to Him by attending First Friday Mass and making a Holy Hour in honor of the Sacred Heart of Jesus. Many people have started their New Year with resolutions aimed at bettering themselves, or more particularly aimed at bettering their bodies. Of course, this is well and good, but as faithful Catholics we need to remember that everything we do should direct us to God. We need to look at our resolutions with eyes of Faith. Sure, we should work at maintaining good health, and of course we should try to kick those habits which do our physical bodies harm, but we mustn’t neglect the health of our soul. These past couple of weeks the liturgical calendar has been filled with feasts and holy days that aim to help us grow closer to the Lord… aimed at helping us prioritize where our focus in this life should be. In our quest for a better body, too often we overlook those things that aid our spiritual health and instead focus on those that only aid the physical. We sign up for gym memberships or start new diets geared at eating healthier, all the while ignoring the eternal nature of our souls. This weekend as we prepare to celebrate the Feast of the Epiphany, why not try to make it to Mass for First Friday or at least spend some time at the chapel in adoration before the Blessed Sacrament. Missed it? Well tomorrow is First Saturday and many parishes have a special Mass in honor of Our Blessed Mother. It would be a great time to start making your faith a priority. For more information on this First Saturday devotion click here. If you really want to make some resolutions this year, start with your heart… I mean soul. There are so many opportunities to grow in the Faith. There is so much more to being Catholic than just attending Mass on Sunday. Why not make the resolution to learn more about the Catholic saints? They are the ones who lived life right. Through all of their difficulties, they kept their eyes on God. We can do the same. Remember, each of us was created by God for greatness. As these first few days of 2019 unfold before us let us make a resolution to love the Lord with all of our heart. Without holding anything back. Sounds a bit radical, I know. Perhaps that might be a bit much… but perhaps, if we don’t, it won’t be enough. All I know for sure is that if you make a resolution to just learn a little more about the Faith and actually read the Truth you will see how the Catholic Church helped shape the world… You will see how the Catholic Church is the vessel in which the Lord continues to pour His Mercy over the world. Knowledge of the history of the Catholic Church is so important in that it helps us recognize the Church’s role in keeping the world from spinning headlong into the abyss of hell. Don’t fall for the lies of the world, because contrary to what the secular world would have you believe, being Catholic… truly Catholic and embracing the Faith and Her teachings with a heart that is open to the Will of God, will do far more for you than all the diets in the world and all the hours spent at the gym. I guarantee. You will be glad that you did… because in the end, God will reward you. His Love for you will not be outdone. Jesus… God made man… the Savior of the world. The Savior of the human race. He is the One that brings man salvation, security and peace… Jesus. It is the name above every other name, and it should be forever on our lips … “Jesus, i trust… Jesus, i love… Jesus, i need… You.” These are the utterances that should get us through our days… not cursings and blaspheming His name. In Jesus, we can see the Love that comes from the Father’s heart. In Jesus, God wished to show man His Love. A perfect Love like no other. Thus, Jesus is the Love of God, so much so, that it is His name that gives rhythm to our beating hearts. It is His name that gives steadiness to our breath when we are unable catch it or hold it on our own. Jesus... the very source that gives strength to our weakness, and lightness to our dark. On this Feast of the Most Holy Name, let us unite our hearts to His. Let us keep Him alive in our thoughts… in our words and in our actions. So that God will use the Name of His Dear Son to purge our souls of sin and help cleanse our hearts of the vices which dwell there. After all, Jesus is the Divine Physician, He will heal our wounds and fill our heart with charity and love so that we may become more like Him on this earth. He has the power to chase away the evil and cleanse our soul. If we love Jesus with our hearts and contemplate Him with our mind He will heal us…mend us…in our body and in our soul. 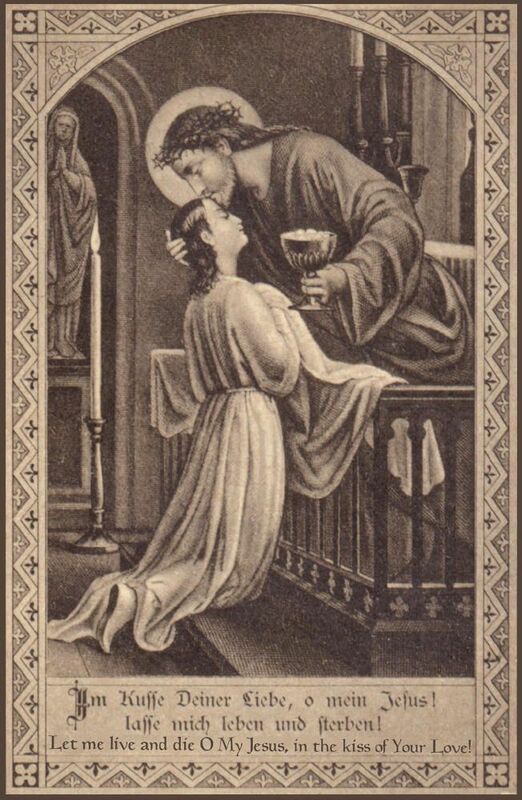 Jesus, the very thought of Thee With sweetness fills the breast! Yet sweeter far Thy face to see And in Thy presence rest. No voice can sing, no heart can frame, Nor can the memory find, A sweeter sound than Jesus’ name, The Savior of mankind. O hope of every contrite heart! 0 joy of all the meek! To those who fall, how kind Thou art! How good to those who seek! But what to those who find? Ah! this Nor tongue nor pen can show The love of Jesus, what it is, None but His loved ones know. Jesus! our only hope be Thou, As Thou our prize shalt be; In Thee be all our glory now, And through eternity. Below is an article from http://www.catholicreadings.org, it is quite beautiful in the explanation of Our Dear Mother. Happy New Year and I hope you enjoy. No one falls in love with a nature. We fall in love with a person. A woman loves a man, not mankind. And a mother pinches the pudgy little cheeks of a new born baby, not the cheeks of a new born nature. St. Mary gave birth to a little person, a baby, unlike any other. In that little person a human nature united with a divine nature at the moment of conception. So St. Mary was the mother of the person Jesus, and the person Jesus had two natures, one fully human and the other fully divine. 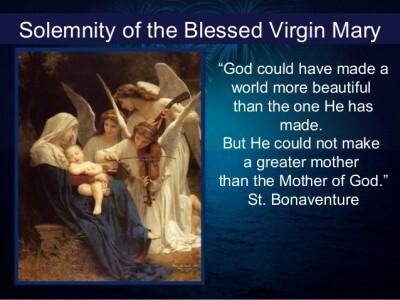 St. Mary was, then, the mother of Jesus’ human nature and of his divine nature. She was both the mother of a man and the mother of God. Two false extremes must be identified and rejected here. Jesus was not really and truly only a God who just faked being a man. Nor was he really a man who just pretended to be a God. Jesus the man did not wear his divinity like a cloak that he could remove from his shoulders when he walked in the door. And the Son of God did not wear a fleshy human mask to conceal the radiance of his real divine face. Jesus was fully God and fully man in a mystery of faith we call the hypostatic union. And because a woman is a mother to a person, not a nature, Mary is the mother of God. This has been the constant doctrine of the Catholic Church since the Council of Ephesus in 431 AD. St. Mary has many titles under which we honor her. Today’s Solemnity commemorates the utterly unique, and unrepeatable, bond she shared with Jesus, a bond no other saint can claim. Jesus and Mary probably even looked very much alike, as hers was the only human DNA in his body. What a beautiful thing that our God did not float down from heaven on a golden pillow. How good that he was not forged from a fiery anvil. How just that he did not ride to earth on a thunderbolt. Jesus could not redeem what he did not assume. So it was fitting that he was born like all of us – from a mom. We honor Mary today for her vocation as mother. If she had disappeared from the pages of the gospel after giving birth to Jesus she still would have fulfilled her role in salvation history. She was obedient. She was generous. She allowed God to use her, body and soul, to write the first chapter of man’s true story, the story of the Church. Like all true stories, the person comes first. A life is lived. The book comes later. God’s Mother gives us our mother – Holy Mother Church, who washes our souls in the saving waters of baptism and thus adopts us into God’s family. The Motherhood of Mary gives the world Jesus. Jesus gives us the Church. The Church then brings us into God’s family where Mary is our mother, Jesus our brother, and God our Father. This is the family of the Church. What pride to be members of so noble a family. O Mother of God, you birthed the one who created all. Within you was He whom the universe cannot contain. How beautiful the mystery. How exalted your vocation that precedes and makes possible the apostles’ own. At home with husband and child you bounced on your knee the one who spins the world on his finger. How beautiful the mystery. Help us start this new year with wonder more than resolutions, with eternal gratitude more than mundane goals.